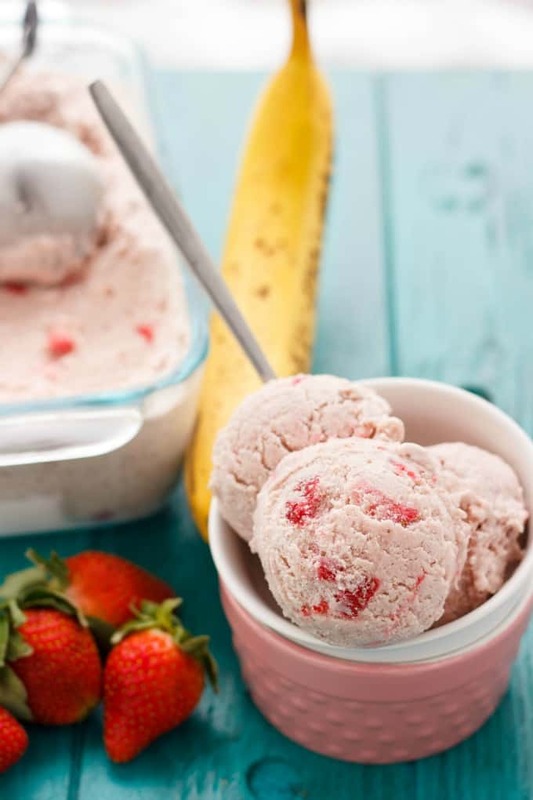 A blend of fresh fruit makes this strawberry banana ice cream stand out! No need for the store-bought stuff anymore! 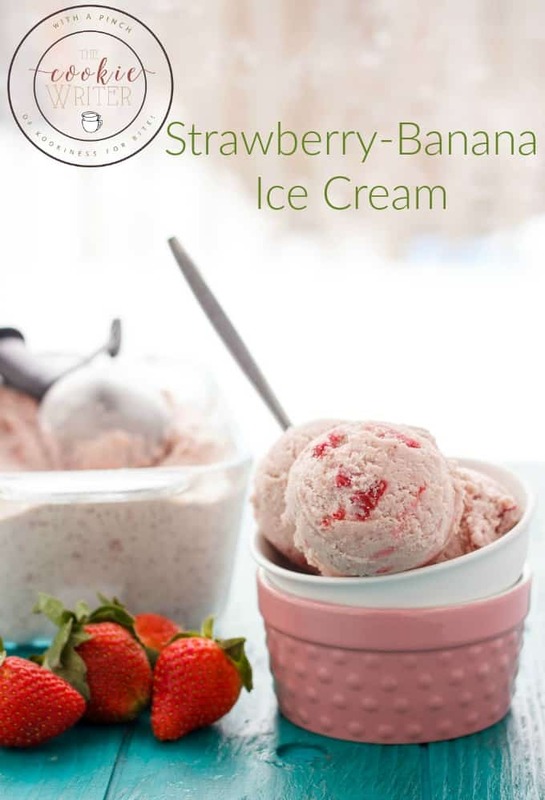 The photos and recipe for this strawberry banana ice cream recipe has been updated as of January 20, 2016! I said when I received an ice cream machine my first recipe would be sweet cream, followed by Amaretto ice cream for my husband. I knew when I went to make this ice cream I would base it off the standard vanilla or sweet cream base. From there, the ice cream was easy to develop. I wanted natural ingredients, not strawberry jam or strawberry syrup. Strawberries are everywhere right now, but even if fresh isn’t available, frozen strawberries would work just as well. As for the banana, I used a large ripe one, and personally found the banana a bit overpowering. Medium-sized for me next time, but banana lovers sure won’t mind the flavour. 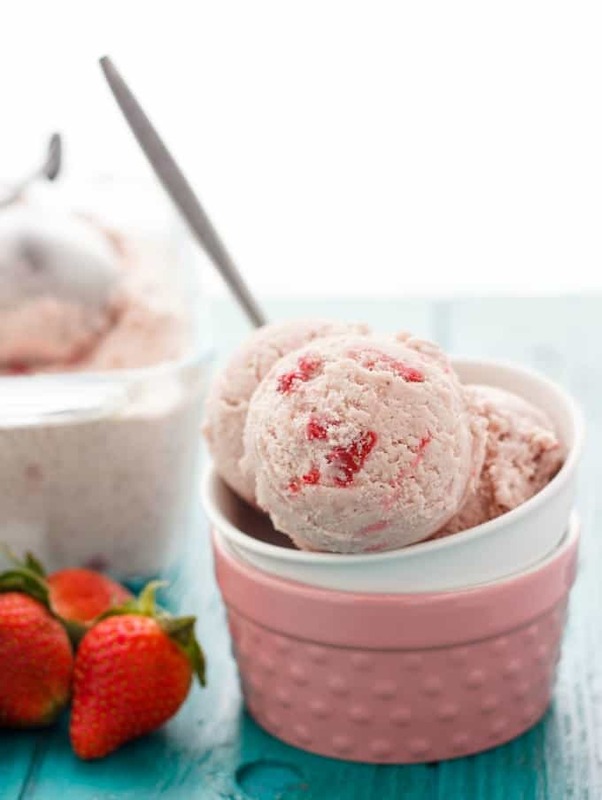 The classic flavour combination of strawberries and bananas make this ice cream the perfect summer treat. Wash and remove stems from strawberries. Place all the strawberries (except the removed ones) and banana into a food processor or blender and puree until smooth. Set aside. Place egg yolks into a large mixing bowl and beat until nice and fluffy (they should lighten in colour.) Combine milk and cornstarch and mix well. In a medium saucepan, combine the milk and 1 cup heavy whipping cream with the sugar. Heat over medium-low and stir occasionally until the sugar is dissolved (do not bring to a boil.) Remove from heat and stir in almond extract. Slowly and carefully pour the hot liquid into the egg yolks, whisking constantly so not to scramble the eggs. Pour back into saucepan and add the remaining cream (that has been mixed with cornstarch.) Stir in pureed mixture. Reheat until nice and hot (but never boiling.) Remove from heat and allow to cool to room temperature. Cover and chill in refrigerator overnight. When ready, prepare according to your ice cream maker's instructions. While the ice cream is mixing, cut the remaining strawberries into small pieces and within the last 5 minutes of mixing, add to your ice cream machine. I gave most of the strawberry banana ice cream to my mother-in-law, but kept a small amount for Girlie. She is, after all, my little taste-tester and helper. Dan never even got to try a bite since we gobbled down our small portions in no time. No worries though, this flavour combination will be made again! « Half Pitcher of Mojitos!